every year zee kannada channel conducting award function to honor artists who appearing for serials and other shows, here is the nominations of 2018 zee kannada kutumba awards . Best Jodi, Best Maga, Best Magalu, Best Kutumba, Best Child Artist, Best Appa, Best Amma, Best Kedi (Male), Best Kedi (Female), Popular Face of Zee Kannada (Male), Popular of Face of Zee Kannada (Female) etc are some of the categories of the award function. 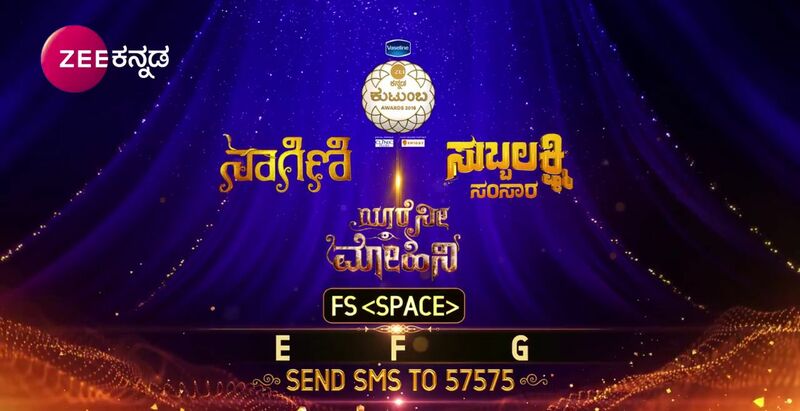 After Announcing the Nominations for each Categories Zee Kannada channel allow different options to vote. Online Voting will be available through zee5.com web portal, Missed Call Voting, SMS Voting, Serial Artist Face Book Voting Selection etc are some of the other options. we will try to update the complete nominations and winners of the award function. Best Comic Role (Male), Best Comic Role (Female), Best Dialouge Writer, Best Screenplay, Best Editor, Best Cameraman, Best Director, Best Anchor, Popular Viewers Choice (Male), Popular Viewers Choice (Female), Most Entertaining Show, Best Non-Fiction Show, Most Popular show of Zee Kannada will be other categories. Koramangala Indoor Stadium Bangalore was the venue for 2017 edition of the award ceremony. Stay tuned here for more updates.